Cervical laminoplasty is performed to relieve compression on the spinal	cord and nerves due to cervical spinal stenosis (narrowing). 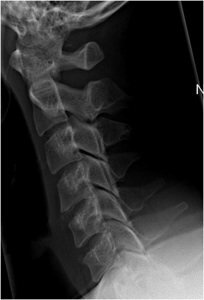 Cervical	stenosis can cause pain in the neck and/or arms, imbalance, clumsiness	of hands, and/or hyperreflexia of arms and/or legs. The laminoplasty procedure	creates more room within the spinal column by opening the lamina on one	side and holding it open with metal plates. Laminoplasty preserves motion	at the operated segment, therefore, is a good alternative to a fusion	operation. 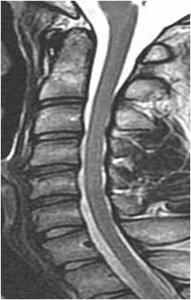 Here is an example of laminoplasty procedure performed on a patient with	symptomatic cervical stenosis. He is asymptomatic at 1 year post-procedure.. Figure 1. 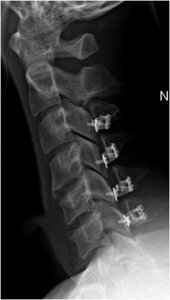 Pre-op lateral x-ray which demonstrates neutral curvature of	the cervical spine with no instability. Figure 2. Pre-op MRI shows cervical stenosis with loss of spinal fluid	(white) posterior (behind) the spinal cord (dark). Figure 3. Post-op lateral x-ray shows expansion of spinal canal with trap-door	laminoplasty procedure being held open with metal plates and screws. Figure 4. 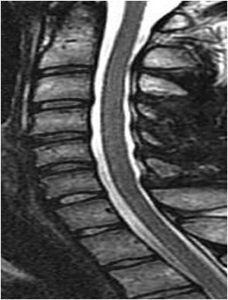 Post-op MRI shows restoration of spinal canal size and spinal	fluid posterior to spinal cord.